Recipe for Slavery: Take US farm labor relations, add “guestworker” visas, and voila… Forced labor! The image above is from an excellent video by Honolulu’s KITV on the news of yesterday’s indictment. You can watch the video by clicking here. Six people in the US were charged in the case, including four employees of Global Horizons Manpower, Inc, a labor recruiting company that specializes in the overseas recruitment of “guestworkers,” foreign workers brought to the US to work in agriculture under an H2A visa for temporary employment in agriculture. Two more people based in Thailand were also indicted in the case. This is not the first time that Global Horizons has been accused of violating farm labor protection laws. ‘In the old days, they used to keep slaves in place using chains and whips. These days, it’s done through economic intimidation,’ Simon said. ‘They couldn’t run away they didn’t have their documents. They were trapped. They were literally trapped,’ said Honolulu immigration attorney Clare Hanusz, who tipped off the FBI about the case two years ago. She represents 56 of the victims in the case. She and fellow immigration attorney Melissa Vicenty sat down with an FBI agent in Honolulu to begin interviewing the victims in 2008, touching off the federal investigation, Hanusz said. ‘There were a lot of tears that were shed at these interviews. It was appalling,’ she said. ‘The guys almost always had their passports withheld. So they were very vulnerable. They were without documentation,’ she added. Also telling about this latest prosecution is the fact that it took place in the H2A, or “guestworker,” context. 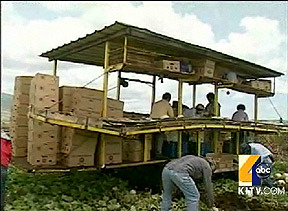 … News of this latest slavery prosecution serves as a timely reminder of the dangers intrinsic to any plan to expand the current agricultural guestworker program (and in the current debate over immigration reform, there are many such plans in the works). But, more broadly, it also underscores the urgent need for broad-based labor reforms in Florida agriculture. Stories of extreme exploitation are so tragically commonplace in Florida’s fields that, rather than hear them as a call to action, we run the risk of growing inured to the abuse, each case of forced labor losing a measure of its ability to spark outrage and action. We cannot let that happen. We must redouble our efforts to make this latest prosecution — now the eighth since 1997 — the last prosecution for forced labor in this state. Lots of love on Labor Day for the Campaign for Fair Food!